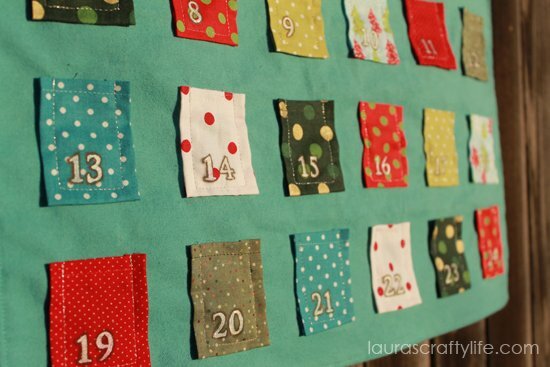 I shared this fabric advent calendar at Sugar Bee Crafts last week. In case you missed it over there, now you can see exactly how I made it! 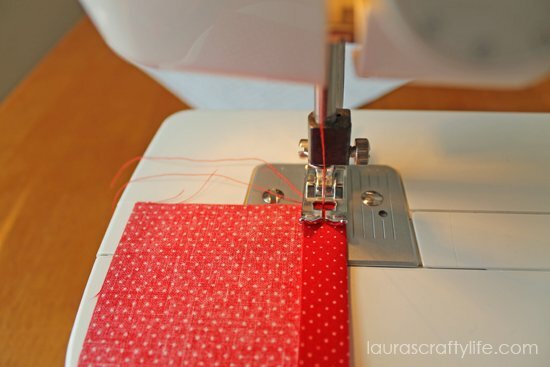 This project is not a quick one, but if you have basic sewing skills – just sewing straight lines – then you can do it! 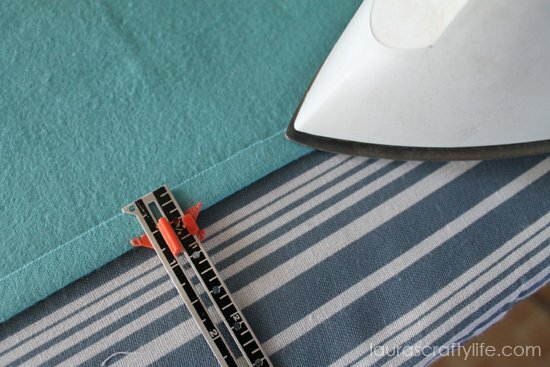 You will also need basic sewing supplies – sewing machine, iron and ironing board, and scissors. 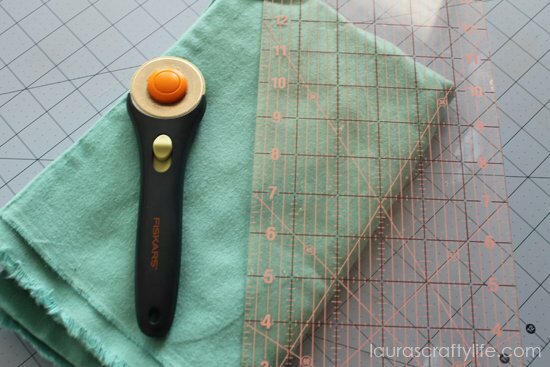 It is helpful to have a rotary cutter, quilters ruler and mat, but not necessary. Cut your flannel to size – 21″ x 19″. The finished calendar will be 19″ x 15″. You need to allow enough extra around all 4 sides for finished seams and a rod pocket at the top. 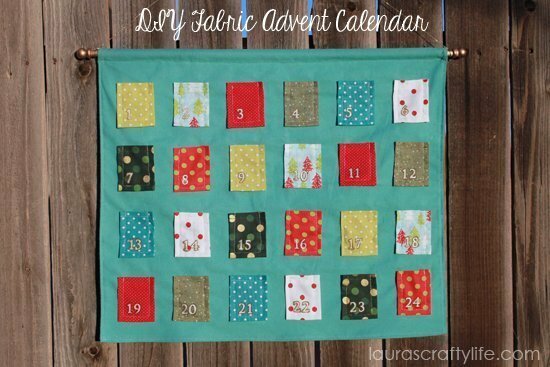 Fold over the side edges of your flannel 1/2″ and iron. 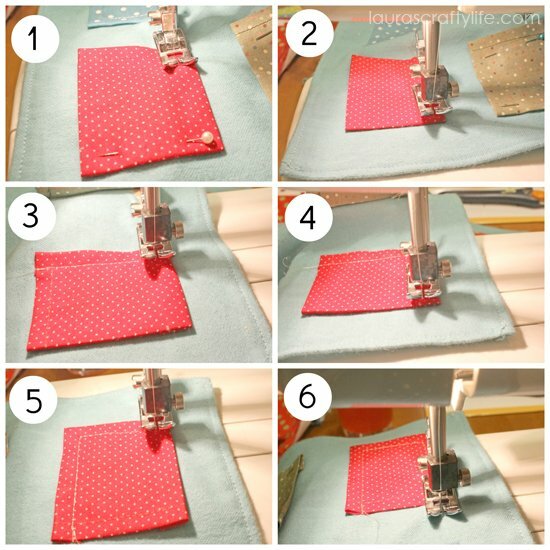 Fold over 1/2″ again and iron again. This will form a nice finished edge. You might notice my finished edge looks small. In my original plan, I had only 1/2″ on each side instead of 1″ for my seam allowance. I adjusted the measurements to make it easier on you. 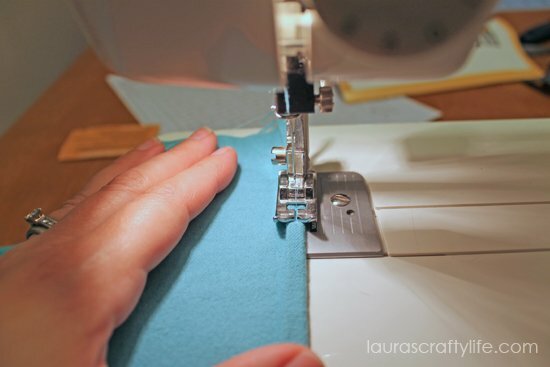 The 1/4″ seams can be tricky! 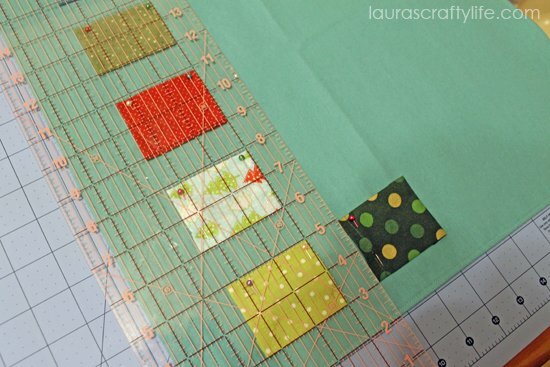 Fold over the bottom edge 1/2″ and iron. Fold over the edge 1/2″ again and iron. 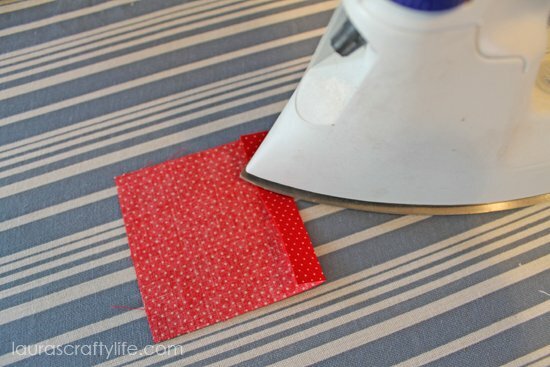 Fold the top edge over 1/2″ and iron. Fold over again, 1 1/4″ this time, and iron. This will create a pocket to place your dowel rod in. Sew close to the edge. 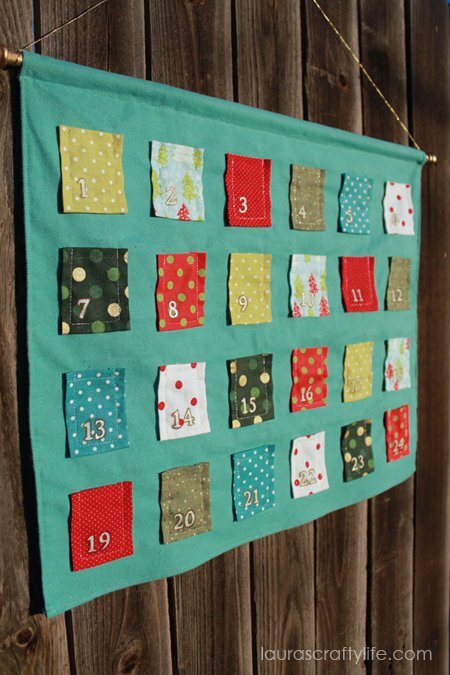 Cut your fabric squares that will be the pockets for the advent calendar – 3″ x 3.5″. 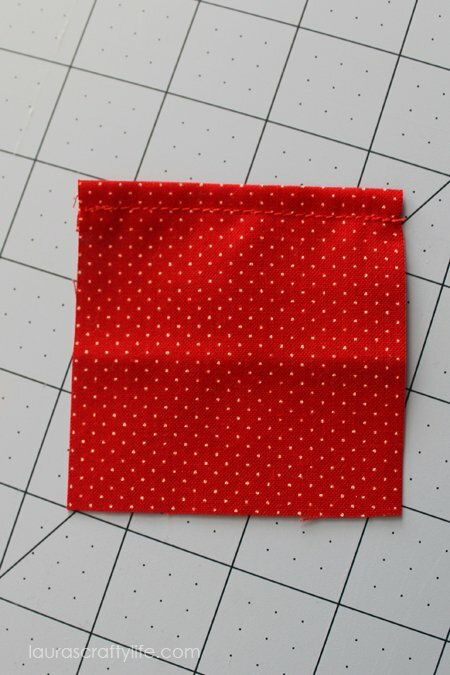 The finished pockets will be 2″ x 2.5″. 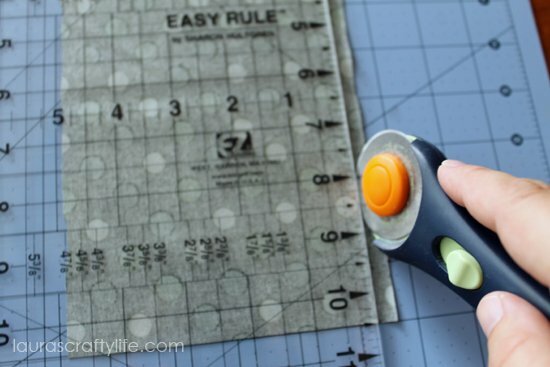 A rotary cutter, cutting mat and quilters ruler come in handy for this part, but it is not necessary. 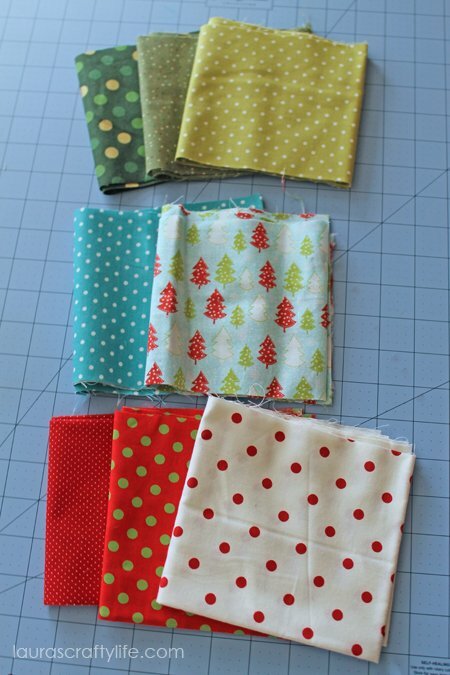 I chose 8 coordinating fabrics, so I cut 3 of each. Adjust how many pockets you cut based on how many fabrics you choose. You want a total of 24 pockets. 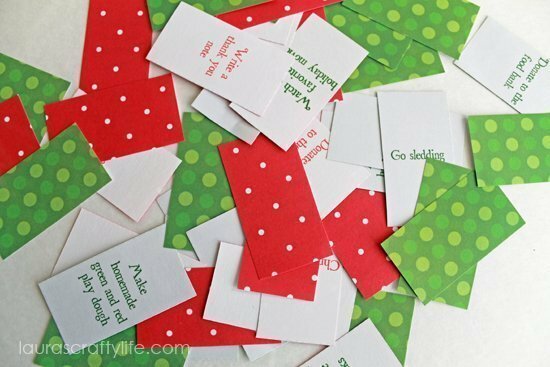 This is a great project to use your scraps. I used some scraps and some fabrics I purchased new. I got 1/8 yard of the ones I purchased and I still have a lot leftover. 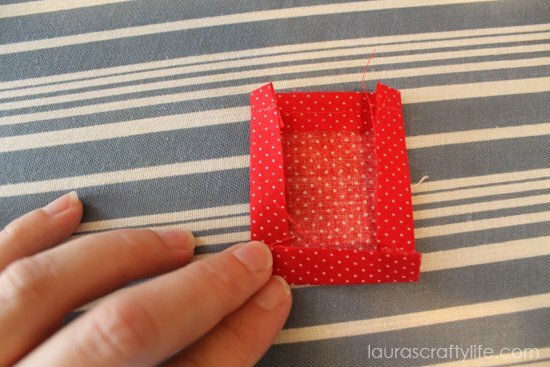 Fold over the top edge of your pockets 1/2″ and iron flat. 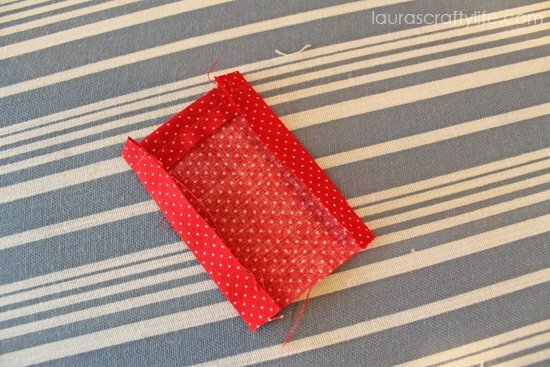 Sew across the top edge of the ironed pocket to create your top seam. Note: I choose to do coordinating thread for the top of each pocket, but to make it easier, you could choose white or black. I wanted mine to only have stitching showing around the three edges of the pocket, so my top edge thread matched each individual pocket. 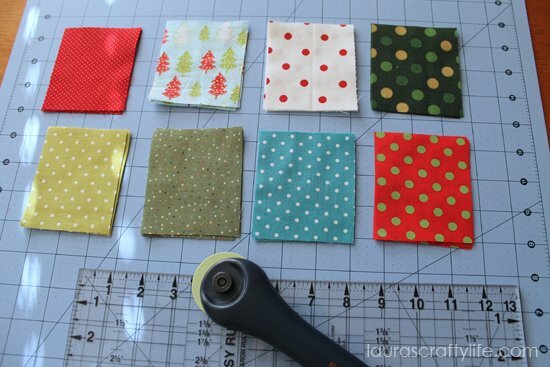 Fold over and iron 1/2″ on each side of the pockets. 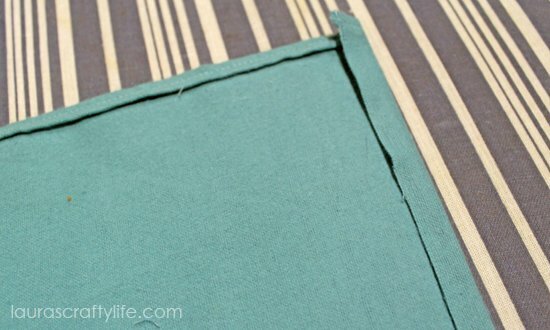 Then fold over and iron 1/2″ on the bottom edge. 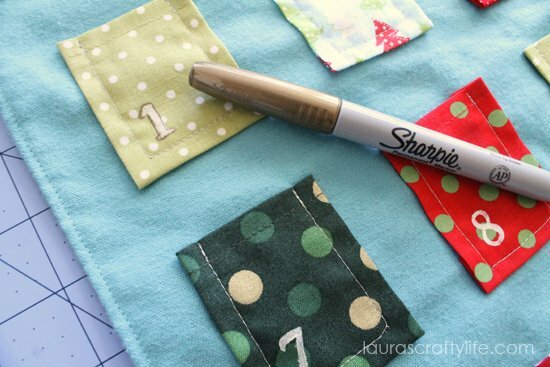 Decide what pattern you want for your pockets, then pin your pockets to the flannel. 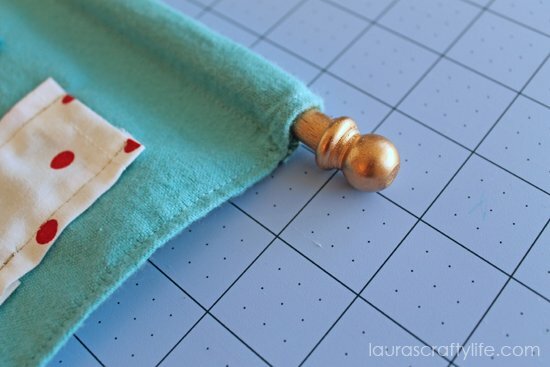 It is helpful to have a ruler handy to evenly space the pockets. Each pocket will be one inch apart for both the rows and the columns. 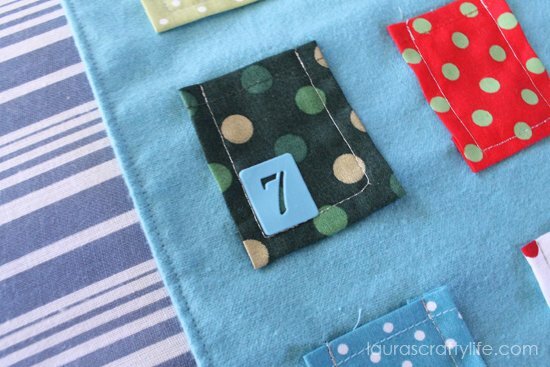 You will end up with 4 rows of 6 pockets each. 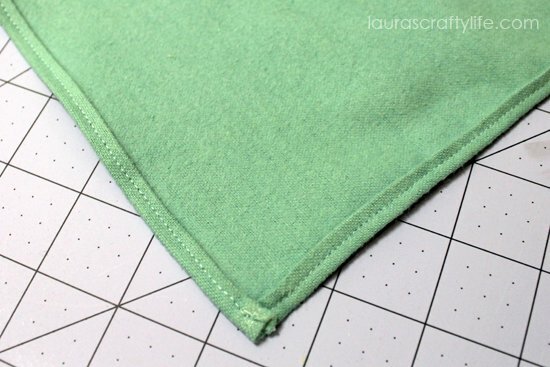 Sew around the edge of each pocket. Back stitch at both the beginning and end of each pocket. 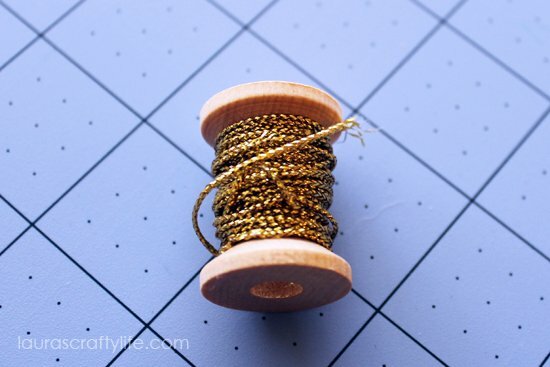 At the bottom of the pocket, keep your needle in the fabric, lift your presser foot, and turn your fabric 90 degrees. Drop your presser foot and sew to almost the end of the bottom of the pocket. Again, leave your needle in your fabric, lift the presser foot, turn your fabric 90 degrees, and sew back to the top of the pocket. Back stitch to finish it off. Do this for all 24 pockets. I used a fun metallic thread for my pockets, but any contrasting thread will work. 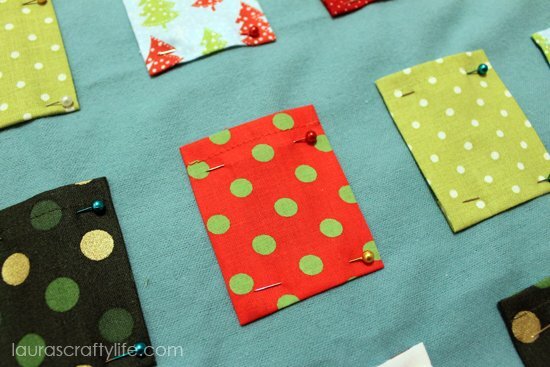 You could also use a coordinating thread for each pocket for a different look. This step is optional, but I wanted to have the numbers on each of the pockets. 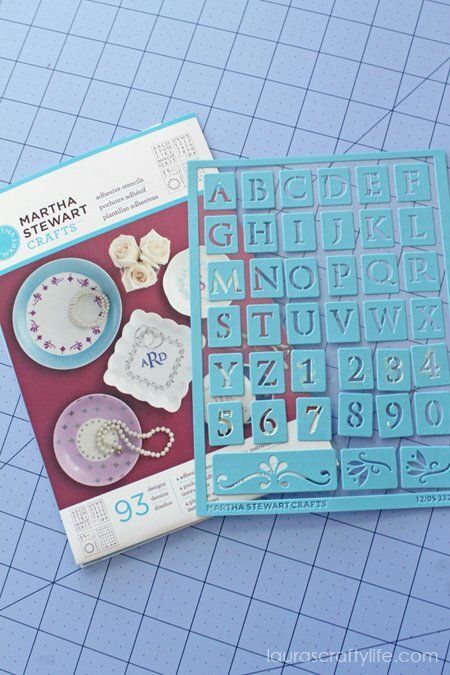 I originally was going to do iron-on numbers, but I could not find any at my local craft store. Instead, I used a Martha Stewart metallic paint in Pale Gold along with Martha Stewart self-adhesive stencils. 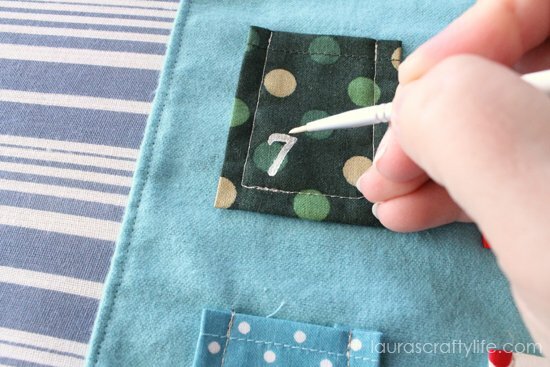 Adhere the stencil to the fabric and paint in the number with a small paint brush. 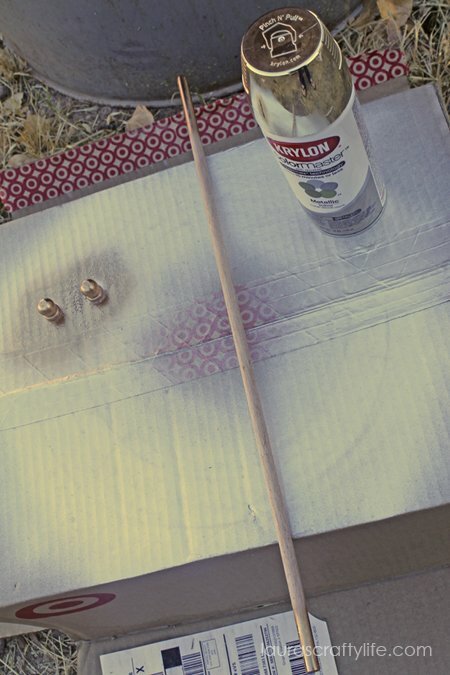 Carefully lift the stencil. I filled in the little gaps on the numbers where the stencil didn’t cover, but this is also optional. 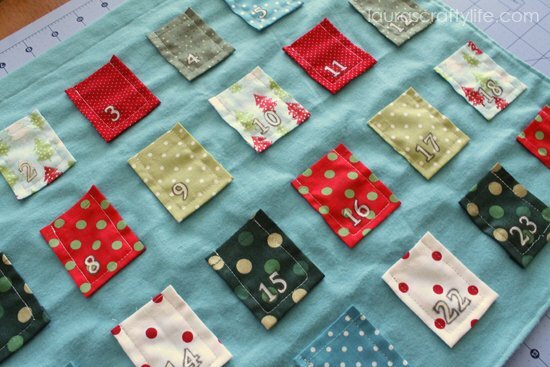 Do this for all 24 pockets and allow to dry. To finish it off and make the numbers easier to see on the lighter fabrics, I outlined each number with a gold metallic Sharpie. Be careful to apply light pressure and not leave the Sharpie in one spot for too long, as it will bleed. Note: Since I don’t plan on washing this, I wasn’t worried about the paint and sharpie holding up to washing. If anything gets on the calendar, I will just spot clean it. Cut your dowel to 20″. I wanted my dowel to look more finished, so I spray painted the ends and the ball finials with gold spray paint. Don’t worry about spraying the whole length of the dowel as it will mostly be covered by your fabric. However, this step is optional. You can leave the wood unfinished or even stain it. Place your dowel rod through the rod pocket at the top. Hot glue the ball finials to each end. Tie on your string or twine. I had some gold twine that I used that finished it off nicely. I will admit, this project was a little tedious and time consuming, but it was so worth it! I love the colors and that fact that I made it myself. And I can finally replace the somewhat cheesy Dollar Tree calendar I had been using! 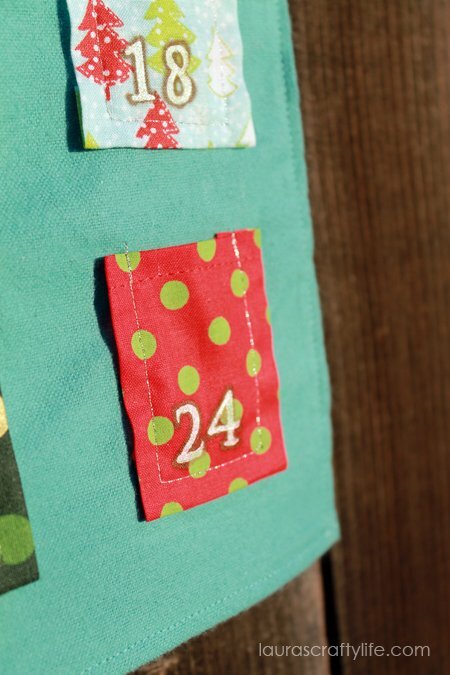 Instead of filling our advent calendar with treats or trinkets, I print out cards with activities for us to do together. I want our holiday to be more about being together, helping others and creating memories, rather than just acquiring things. 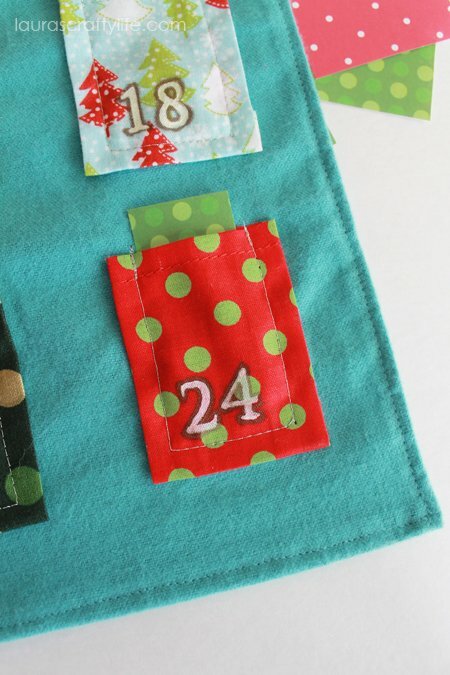 You can snag your own printable advent calendar activity cards over at my blog. They are sized to perfectly fit into the pockets! Laura, you are so talented! You could sell these to Pottery Barn Kids! If I could sew I would make this for sure! You’re welcome! This project was a little tedious, but I am looking forward to pulling it out each year! Just wanted to say thank you for posting the step-by-step instructions! I am a brand new sewer and just finished this as a gift for Christmas. It came out GREAT; thanks so much for posting! I am so glad! I am still teaching myself all the tricks of the trade. I am glad this tutorial helped you out. I would love to see your finished project!